Finally! All the quilts were finished, excess thread dye was removed, and I spent yesterday measuring, photographing and cataloguing the eighteen small quilts in the “what they said” series. 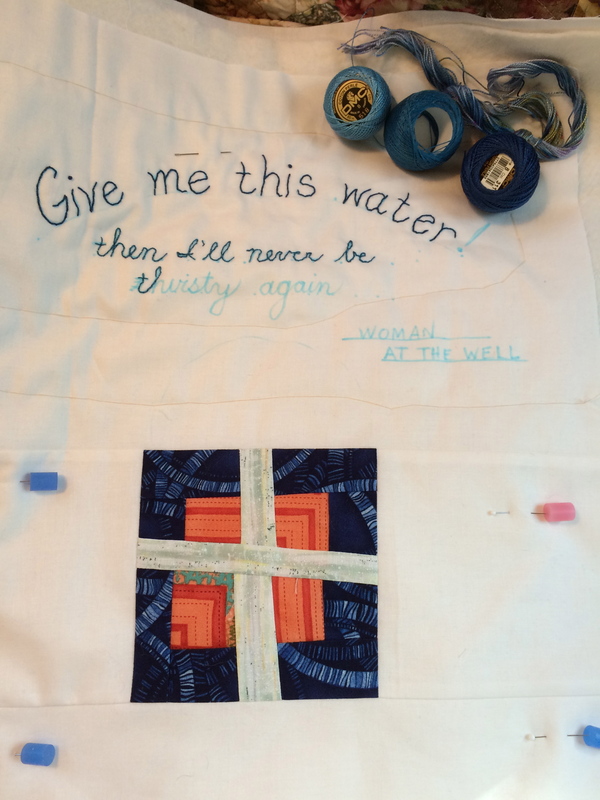 My goal was to allow the words to be preeminent in each quilt. Who said the words was also important for the context. I tried to think about what each person was thinking and feeling and to convey that in the way the wording was embroidered. The quilting was secondary. 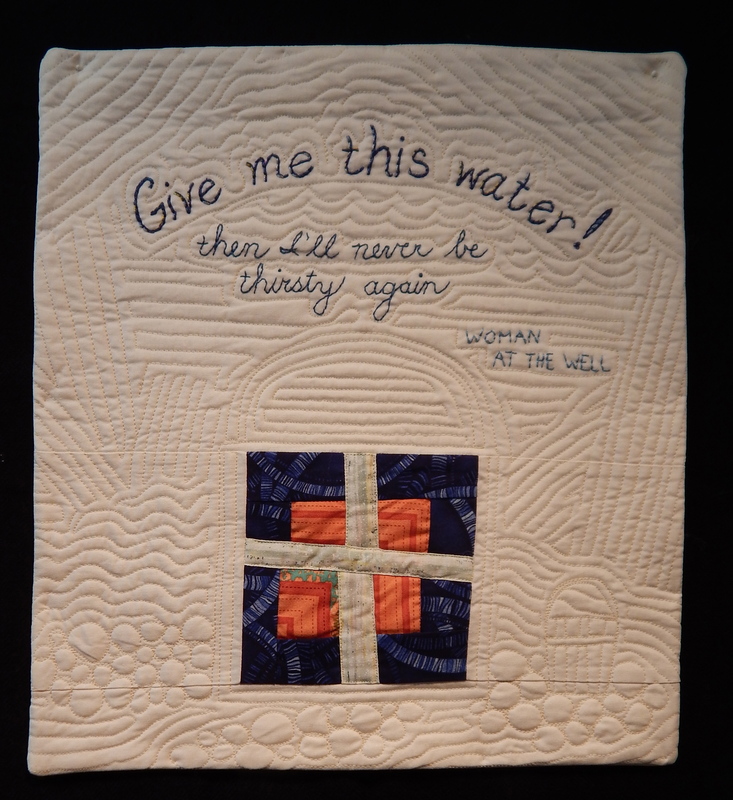 Some of the quilts have little hints at the setting behind the speech. 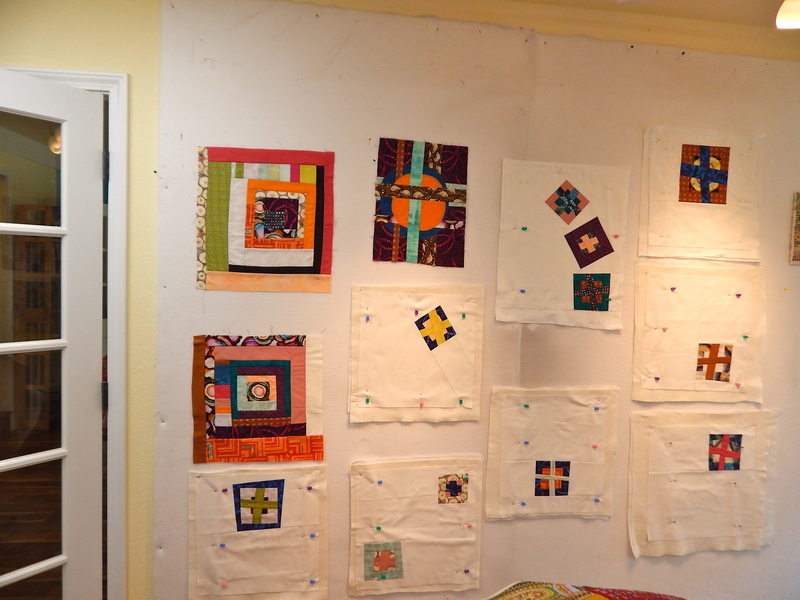 All of the quilts have a single block from one of my self-retreats, and Kona Snow fabric is the setting. I was going to create a slide show of them, but after fooling around with that for a while, I realized that I could put them on a gallery page on my website so that they could easily be viewed as an entire group. You can view all the quilts in the galleries on my website. Enjoy! Posted in "what they said"
I have been busy busy busy. Finishing and quilting and embroidering and starting. Here’s what part of the studio really looks like. I actually finished all eighteen of the “what they said” series. I will do a slide show for you soon. But I have a question. Five of them had some of the hand-dyed threads on them, and the thread colors ran. I put Shout on them, and then I ran them through the washer with a “color catcher.” Some of the offending color came out, but not all of it. Do any of you have any other ideas? Have you tried applying color-safe bleach with a Q-tip to the dye stains? Anyway, I am very happy to have completed them. My plan is to mount them on cradled wood panels. So that part is not done. I will order some this week, to make sure my idea will work, and then I will order the rest of them. By the way, I love the Juki more than ever. I love how very accurate each stitch is. 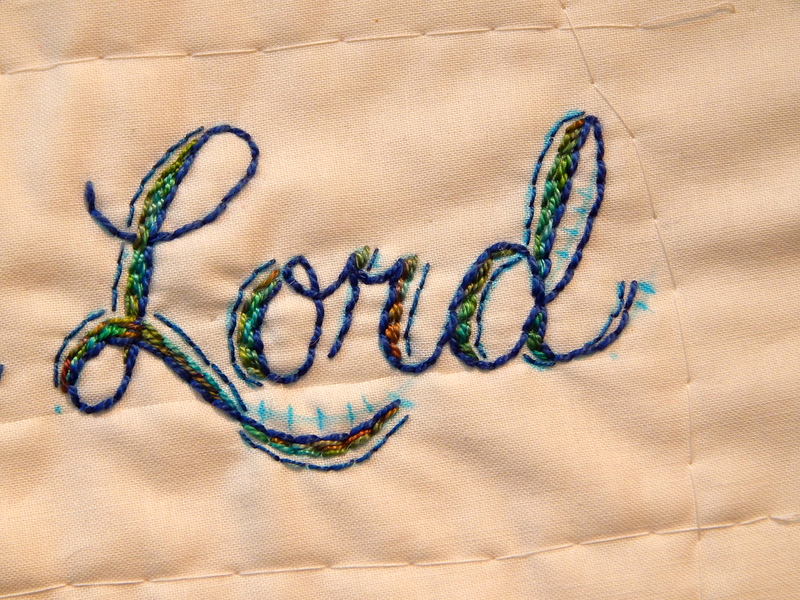 It is easy for me to exactly stitch over a line of stitching to get to the next area I need to work on. You can see some of the panels for the Hallelujah Chorus quilt perched over there on the chair. 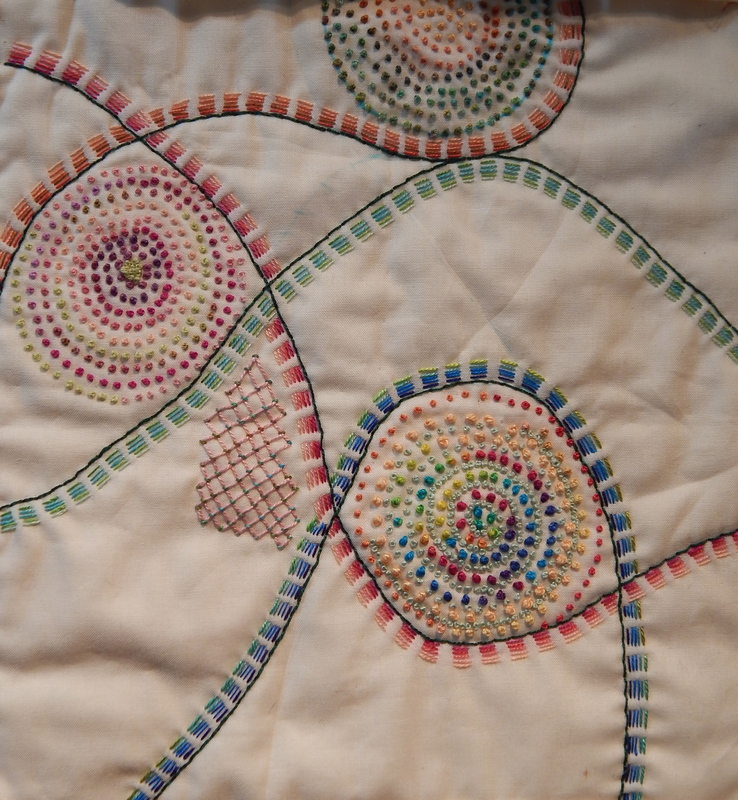 I have almost finished the panels and the four large embroidered circles, and so this week I should be able to put the panels together into a quilt top. And then I will have to decide what the next step is. 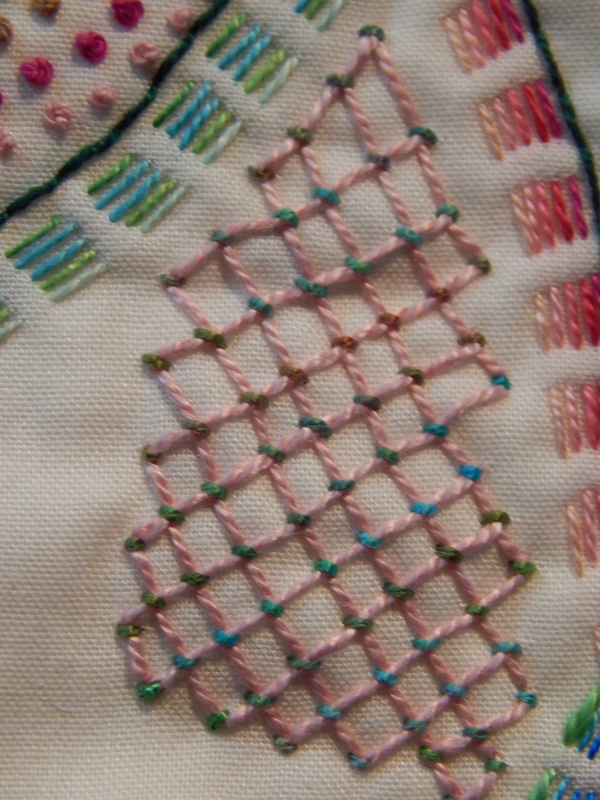 More embroidery, or machine quilting. Any which way, I am very excited to get to this next stage of the project. I entered four quilts in Quilting in the Garden, and they were accepted. This is such a nice event, and of course, I LOVE the nursery where it is held. I am planning to take my mom to it this year, and thought it would be fun for her to see some of my quilts hanging. And then, about that “thinkie” project. I spent a little time on it. I traced the photo on my 1/4 inch graph paper, and then went to the copy store and enlarged it 400%, which made it a 10 inch finished block. Then I spent some time drawing a pattern for it. I made the pattern because Kris had suggested that it might be a fun group project. I don’t think that’s gonna happen, but if any of you are interested in the pattern, you can email me (schnabel@volcano.net), and I will be glad to email you a copy of it. The trouble with teaching is that it takes a lot of brain power to prepare for it. At least that’s how it is for me. I can’t really think about starting a NEW. IMPORTANT. PROJECT. when I am thinking about teaching. All I can think about is “oh, I could share this,” or “wouldn’t that be great to have a sample of that to share.” And you can see, those are not bad thoughts. I just won’t be starting one of the big projects I have in my mind until after this teaching gig is done. In the meantime, I wanted to have as many examples as possible to share with the class. 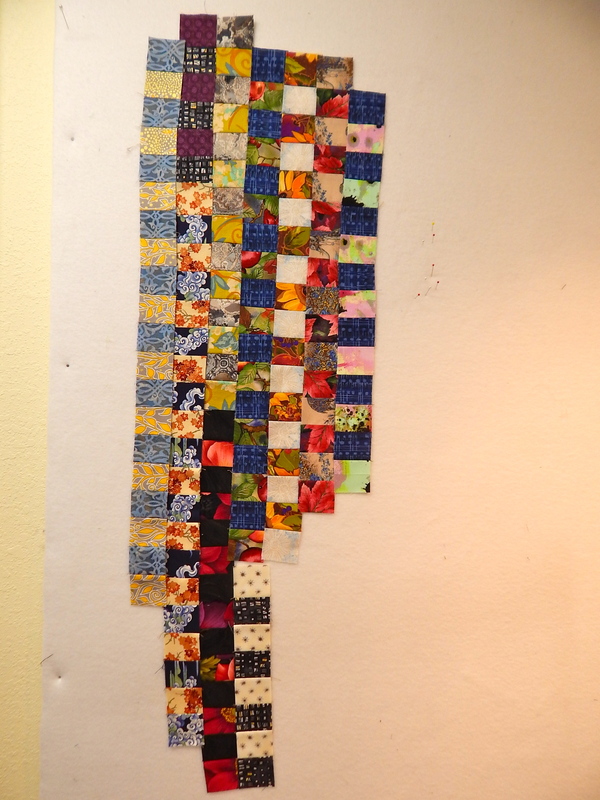 I had a LOT of unfinished samples…ahem…have I mentioned I don’t like binding quilts? In fact, I had five small pieces that needed to be finished. So one by one, I set out to get that done. I also didn’t have any handwork for my evenings, so finishing these substituted for that for a few days. This is the “header” for the “what they said” series. It has a facing instead of a binding. This is my favorite method to face quilts now. You’ve seen this before. Its not finished (I’m planning to bead it) but I wanted to take it to share with the class. So now it has a binding on it. And a binding on this little wonky piece, just to keep it contained. Oh, you’ll notice that I hand-stitched the binding to the front. Usually I machine sew my binding down. But I always say I think its weird that quilters do all of that beautiful hand-work on a binding, and hide it on the back. And this piece has been hanging around FOREVER, with unfinished edges. That was partly because I just didn’t know what to do with it. It was stitched almost to the very edge, and I didn’t want to cover up any stitching with a stupid old binding. I thought about zig-zagging the edge. And then it came to me–just do that by hand! It took quite a while. But I think it is the perfect edge for this little piece. As I mentioned, I didn’t have any piece to work on in the evening. This was driving me nuts. I also have seen quite a few things lately that have little tiny pieces of fabric sewn together. I got this book. Her work fascinates me. So finally, after all these little quilts were finished, I decided one night to just make a sandwich out of some leftover muslin and batting that was laying around in the studio.I brought the sandwich, my bag of Cherrywood little scraps, and four or five “neutral” fabrics out to my comfy chair. I was somehow going to sew patches on top of this. As soon as I sat down, I knew I didn’t want to have muslin showing through on the front. So I set about hand piecing little bits of fabric together. Yesterday I got tired of hand-piecing, so I put the rest of it together by machine. And now I have a fun little piece to stitch on in the evening. So you can see, there are more good than bad things about teaching! I am looking forward to this assignment. Sometimes I have to write a post just to remind myself that I am getting work done. I titled this “Dabbling,” which I did indulge in a bit. But I also, I can see now, have progressed forward in my intentional art. And because of this blog, I can look back and see that it really was just a week ago that I posted about “switching gears,” because I wanted to get back to my rug hooking. 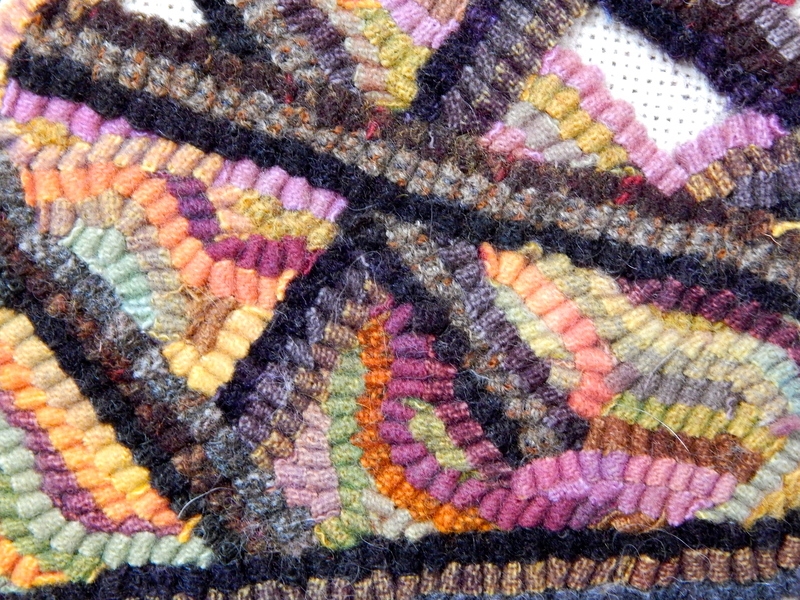 The thing about rug hooking–its that old saying “absence makes the heart grow fonder.” Suddenly, I get all sentimental, and miss my quilting horribly. And I think of all kinds of new, wonderful ideas that I MUST. TRY. RIGHT. NOW. My box of little two inch squares was calling to me! What if I made long chains of the squares. Wouldn’t that be fabulous? Then, I got a card that had painted flowers on the front. MUST TRY to reproduce those flowers! I pulled out a huge stack of pink, coral, and golden solids. Free-hand cut the fabrics for these. Not that fabulous. Plus, I think its been done before. Like in the 70’s or something. I had seen the work of this artist at the San Jose Museum of Quilts and Textiles. French Knots! Must do french knots! Of course, JUST french knots did not last very long. And I did not do all this embroidery in the past week. But I did do a significant amount of it, just as way of avoiding other stuff. This is a fun little bit to do. Marianne Burr taught me this. 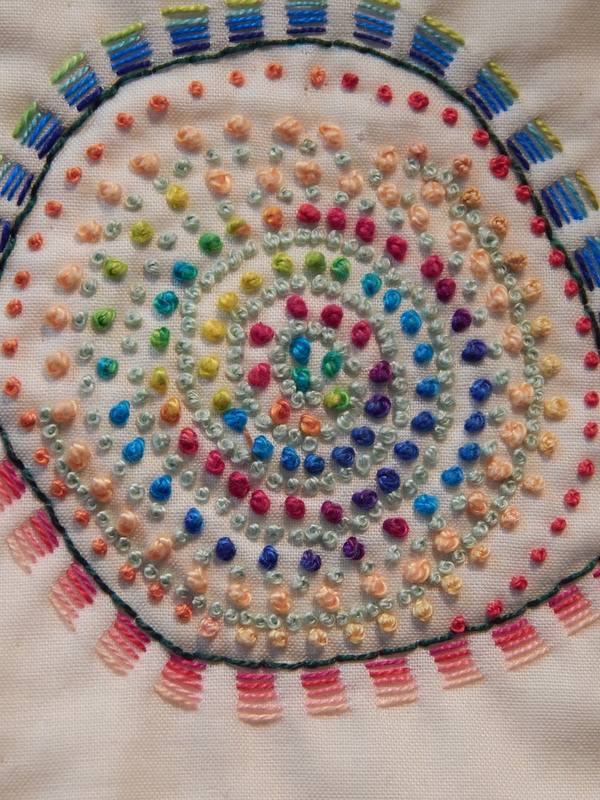 I am always so inspired when I see the work of an artist who does everything by hand, like Marianne Burr and the french knot artist, and most recently, I came across this woman’s work. And then I start on a little piece like this, and inwardly I am whining, “but it takes soooooo lonnnnggg.” I can only laugh at myself. 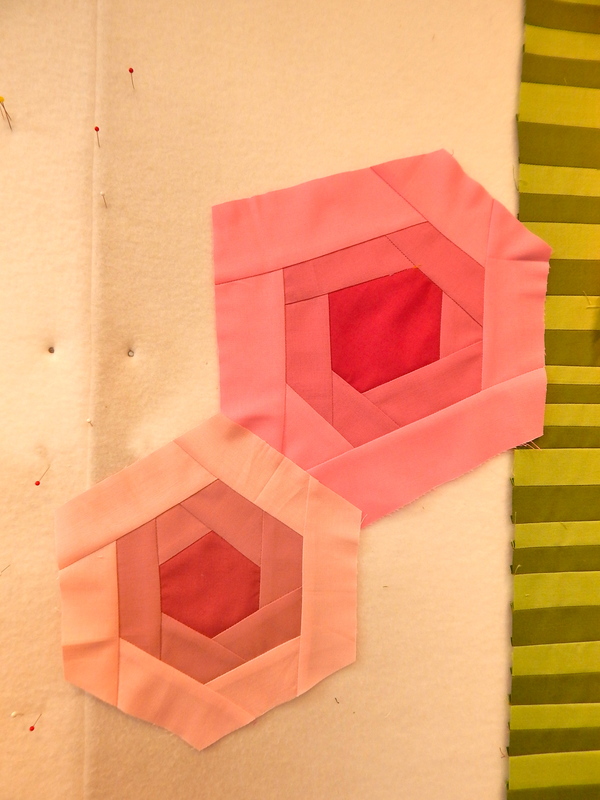 I made myself finish the quilting on the first one, and used Ricky Tims’ clever method of facing. 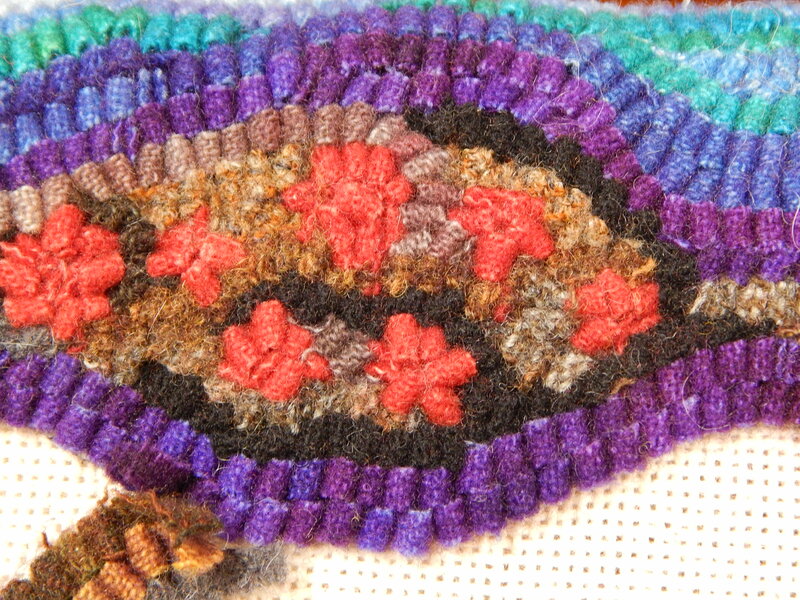 And really, I did continue to do some rug hooking. Each section requires a bit of thought and of course a lot of angst. Is that color right? Is there enough contrast? Too much contrast? Am I just indulging my love of using ALL THE COLORS ALL THE TIME? Wow. I am surprised at how much I have gotten done. I thought my week had been disrupted by OTHER STUFF, like exercise, gardening, and housecleaning. If you just insist on continuing on, it is surprising and rewarding to see the body of work that you can eventually produce.